The following in a guest contribution form Riley of Young and Invested. The earned income tax credit is a powerful tool for getting money in the hands of individuals and families with low- to moderate income, parents in particular. Depending on filing status and the number of dependent children, working individuals and families with maximum incomes between $15,270 – $54,884 may be eligible for the earned income tax credit in 2018. 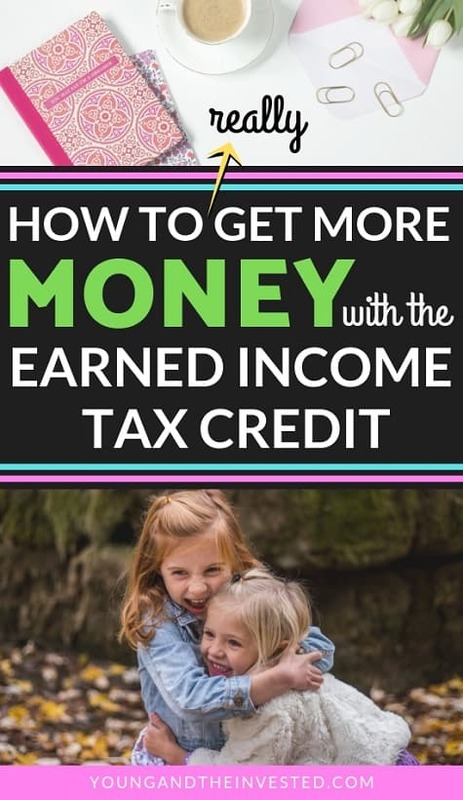 While you don’t need to have children to qualify for the tax credit, the income limits are much lower and the tax credit is much less generous. For reference, in 2016, nearly 26 million working families and individuals received the earned income tax credit in 2016. When it comes time for filing your taxes, you want to receive as many tax credits as you possibly can. Unlike tax deductions, which lower your taxable income, tax credits count dollar-for-dollar against your tax liability. For example, if you owe $2,500 in income taxes but qualify for a $500 tax credit, you only pay the IRS $2,000 ($2,500 tax liability – $500 tax credit = $2,000 new tax liability). In some instances, a tax credit might result in a negative tax liability, which entitles the taxpayer to a refund if the tax credit is refundable. The earned income credit is a refundable tax credit. In other words, one of the earned income tax credit benefits is that it doesn’t just reduce the amount of tax you owe, it also could result in a tax refund. The earned income tax credit is intended to assist working low- to moderate-income individuals and families by providing supplemental, refundable tax credits to provide additional income for added support. To see if you qualify, make sure you check the earned income tax credit 2018 rules below. By design, the tax credit only benefits working individuals and families. All things being equal, families with children receive a much larger credit than workers without qualifying children. How Much Money Can I Get with the Earned Income Tax Credit? The amount of earned income tax credit depends on the level of income, your filing status, and the number of dependent children you claim on your tax return. The earned income tax credit table below shows how the credit varies. Generally speaking, more income results in more of a tax credit up to a point. Also, families with children will receive a larger credit as opposed to families without children given the credit’s design. However, you do not need to have children to qualify for the tax credit. If you have no qualifying children, the maximum earned income tax credit amount is $519 in 2018. As mentioned before, having children results in higher possible credits. Depending on your circumstances, families in 2018 with one child can receive a maximum $3,461 from the credit, while families with three or more children can receive a maximum of $6,431. $49,194 with 3 or more dependent children. $54,884 with 3 or more dependent children. For a visual representation, look at the earned income tax credit tables below. The Earned Income Tax Credit: Who Qualifies? Earned income tax credit qualifications are fairly straight forward. However, the tax code includes a lot of complexities as well. In the case of the earned income credit, you will encounter phase in’s and phase-outs with various associated rates. For a deeper dive into these numbers, see the following earned income tax credit tables. Note: Unmarried filers who claim children for the purposes of the Earned Income Tax Credit usually file as heads of household; the parameters for each family size are the same as for single filers. Internal Revenue Code, 26 U.S.C. §32(b). Must earn at least $1 of earned income (meaning pensions, unemployment or other unearned income do not count towards this requirement). Your 2018 investment income must be $3,500 or less. Finally, it is worth noting there are special rules for military members and those in the clergy. Additionally, for people who receive disability income or who have children with disabilities. How Do Kids Affect the Earned Income Tax Credit? Having children greatly improves your earned income tax credit. As shown in the chart above, having qualifying dependents results in greater amounts of earned income tax credit benefits. The IRS requires qualifying dependents to meet certain tests. The term dependent in this case means a person, other than the taxpayer or spouse, who relies on the taxpayer for support. Prior to tax reform, each dependent entitled the taxpayer to a dependency exemption. However, exemptions have been discontinued under tax reform in favor of a higher standard deduction. Relationship. The child can be one of the following: your offspring (son or daughter), adopted child, stepchild, foster child or grandchild. Additionally, the child can also be your sibling, half-sibling, step-sibling, or any of their children, assuming you provide financial support for more than half of their living expenses. Age. The child must be younger than 19 at the end of the tax year (2018) and younger than you or your spouse (if filing jointly). However, if the dependent child is a full-time student (to be considered a full-time student, the child must be enrolled for the number of hours or courses the school considers to be full time and must be a student for at least five months during the year). Most institutions allow 12 hours per semester to qualify as “full-time” but be sure to check at the dependent child’s institution. There are no age limits for children who are permanently and totally disabled. Residency. The dependent child must have lived with you or your spouse in the United States for more than half the year. There are exceptions for temporary absences. The child is considered to have lived with you even if you are not physically together for a period due to separations caused by illness, education, business, vacation or military deployment. Joint Return. To qualify as a dependent child, the child must not have filed a joint return with another taxpayer unless that return is filed only as a claim for a refund. A child must meet all of these tests in order to qualify as a dependent child. As another note, multiple people cannot claim this child as a dependent. What If I Don’t Have Kids? Do I Still Qualify for the Earned Income Tax Credit? In short, yes. You can still qualify for the tax credit if you don’t have kids. However, the earned income tax credit you will receive is much less and also requires much less in income. As you can see from the earned income tax credit tables from above, the amount received and income limits are less. How Does the Federal Government Shutdown Affect My Refund? When Can I Expect to Receive It? Depending on the staff available to process tax refunds at the IRS, it could vary. However, if you claim the tax credit or the additional child tax credit on your return, the PATH Act will not allow tax refunds to be disbursed before mid-February. In fact, the IRS expects the earliest earned income credit related returns to be available in taxpayer bank accounts or debit cards is February 27, 2019. Therefore, depending on how long the federal government shutdown lasts, it may not impact your ability to receive the credit in a timely manner. The earned income tax credit was created with the Tax Reduction Act of 1975 and it was designed to benefit low-income families with children by offering a fully refundable tax credit. Additionally, the tax credit was included in the tax code with specific direction to offset payroll taxes, which take away from worker earnings. The earned income tax credit has wide bipartisan support in Congress due to its effectiveness for fighting poverty for low and middle-wage workers. Additionally, the earned income tax credit qualifications provide for phase-outs at higher income levels as workers no longer need the extra support. Several legislative efforts have attempted to make the tax credit more robust and reach a broader set of qualified recipients. Because of the success in fighting poverty (discussed below), many attempts have tried to expand the program. Previously, there have been attempts to extend the credit for childless workers. These proposals included expanding the eligible age limits for childless applicants, lowering the age of eligibility from 25 to 21, and increasing the age of eligibility from 65 to 67. Additionally, there have been attempts to increase the maximum credit, expand the income range over which the credit is available, or even to separate the credit into two credits: one for childless workers and one with children. Does the Earned Income Tax Credit Fight Poverty? According to the Center for Budget and Policy Priorities, the tax credit has been the single most effective antipoverty program for working-age people. The credit has lifted about 5.8 million people out of poverty, including 3 million children. In fact, because the tax credit goes primarily toward the lowest earners, the funds help to raise the poorest earners out of poverty and act as a mechanism to incentivize work. Despite the credit tapering in effectiveness as wage earners work and earn more, it still promotes the idea of working to earn your way. In 2018, I earned my CPA license in the state of Louisiana. After years of attending night classes, studying for my exams, and passing them, I have received the top accounting credential. I’ve recently started publishing more content about income tax deductions and tax strategies useful for saving you money. I’m taking my efforts one step farther by volunteering my time to help others file their tax returns and qualify for as many tax credits as possible. My work offers a program to train volunteers on how to provide free tax services for qualified individuals. The company encourages employees to support IRS-sponsored Volunteer Income Tax Assistance sites during the 2018-2019 tax season and I plan to help out by helping low- to moderate-income taxpayers file their tax return for free. The hope is to help as many people as possible qualify to receive the tax credit. I am volunteering my time to aide in this effort and feel it would be an impactful use of my CPA license. I charted a very different course from the one I originally embarked on and feel I have landed in a more appealing destination as a result. In the process, I’ve become a senior financial analyst at a Fortune 500 company, earned my CPA, and aspire to help young professionals navigate the sometimes-murky financial waters. In my spare time, I follow finance industry trends, practice a ketogenic lifestyle, and train for endurance events. Young and the Invested is meant to be an online community dedicated to finding financial independence. I strive to build this online community by examining financial issues of interest to younger professionals. I have not been compensated by any of the companies listed in this post at the time of this writing. Some posts may contain affiliate links, meaning, at no additional cost to you, I will earn a commission if you click through and make a purchase. Any recommendations made by me are my own. Should you choose to act on them, please see my disclaimer. This post originally appeared on Young and Invested, and has been republished with permission.